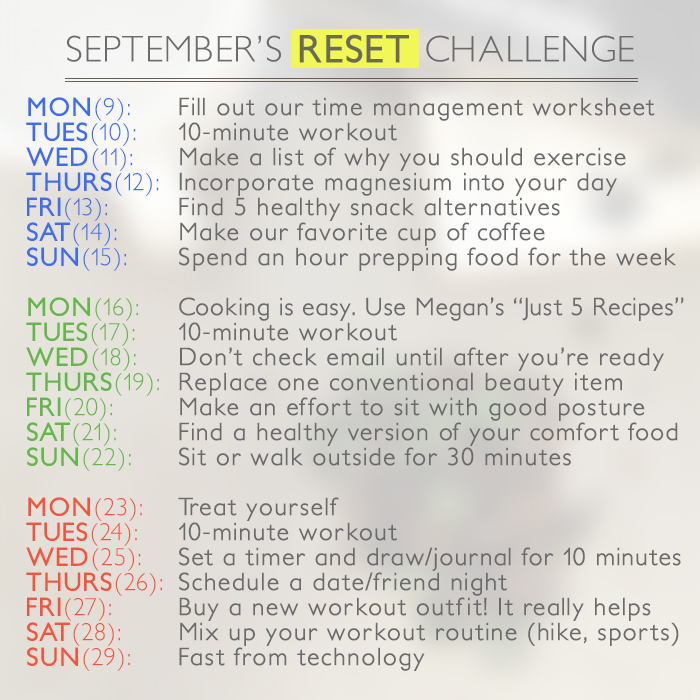 Our September RESET Challenge has officially begun! We’re excited for all of you who are participating from afar. Below you’ll find a more detailed 21-day plan with explanations, suggestions or accompanying documents. If you have any questions or comments – use the comment section below or Tweet/Facebook/Instagram us! Monday, Sept 9: Fill out our time management worksheet. It is super hard to make sustainable healthy habits “stick” without a little planning ahead. It all comes down to how we simply manage our time and what we decide to give priority to. So for today’s challenge we want you to study the time management matrix by Stephen R. Covey. In order to evaluate your own situation, make a master list of as many of your daily activities that you can think of, and place them in the corresponding quadrant. 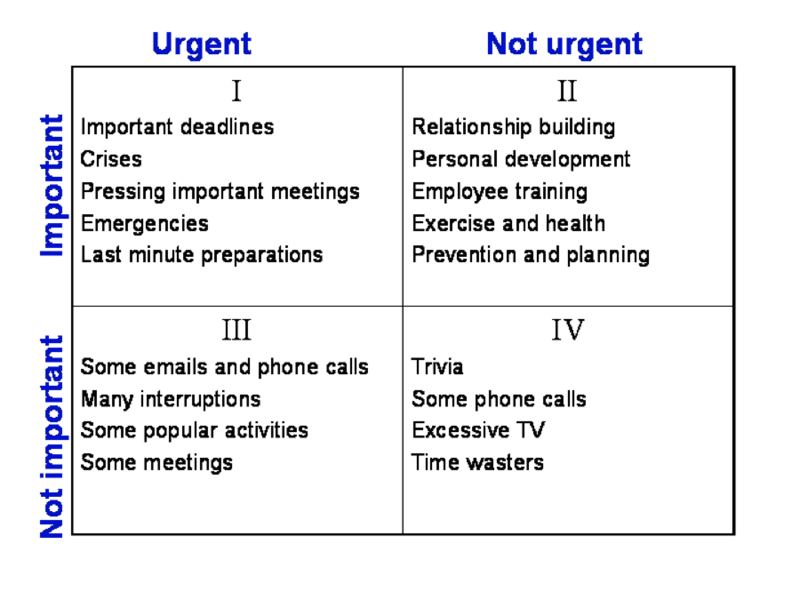 In which quadrant do you spend most of your time each day? With this new knowledge you can begin to move your time into Quadrant II, which provides you with solid direction and invests in your future! Download the worksheet here. Tuesday, Sept 10: Time for a 10-minute workout. Max reps in 10 minutes. 20 sec of push-ups. 20 sec of squats. 20 sec of sit-ups. Wednesday, Sept 11: Make a list of why you should exercise. It’s one thing to hear “why” we need to exercise from leaders in the health industry. It’s another thing entirely when we list and know all the reasons why we personally should exercise. Exercise, just like any other area in our lives, is a very personal thing. We should decide the why behind why we want to exercise for ourselves. Make your list today. Do it for you. What are your reasons? Keeping up with my future grandchildren is one of mine. Thursday, Set 12: Incorporate magnesium into your day. We are all more than likely deficient in this wonderful and important mineral. We don’t care how you choose to get this mineral today…we just want you to! Here are several ways: 1) soak in an Epsom salt bath, 2) take a magnesium supplement, 3) use magnesium oils and apply directly to skin (here is a recipe), 4) or be like pop-eye and eat some spinach! Friday, Sept 13: Find 5 healthy snack alternatives. What do you normally snack on? If it tends to be processed, high sugar, or full of yucky ingredients look for some alternatives today! If you want some chocolate then choose higher % dark chocolate for antioxidants. Craving chips? Go for some kale chips. Easy options that are simple include: banana and almond butter, raw cheese, almonds, etc. Find what makes you happy and replaces the junk out there in the market! Saturday, Sept 14: Make Our Favorite Cup of Coffee. We are talking about this amazing coffee right here! It’s coffee and healthy fats- nothing better. If you are not a coffee person we ask you to incorporate some grass-fed butter or coconut oil in your diet today. Let’s keep busting the myth that fat is bad for us… it’s so not! Sunday, Sept 15: Spend an hour prepping food for the week. Preparing and planning can make or break a good week. Isn’t that the truth? Spend one hour today prepping your food for the week. Wash and chop up your vegetables and store for easy access. Think about how much time this will save you when reaching for a quick snack, throwing together a salad, or even roasting up some vegetables for dinner. You could even spend time making a big batch of chili or soup for the week. You decide and enjoy the time you saved in the week to come! Monday, Sept 16: Cooking is easy. Use Megan’s “Just 5 Recipes.” We kinda love Megan from The Fresh Exchange and really hope to have her on the blog someday. She has made today’s challenge easy for us. Go check out her blog and her series on “Just 5 Recipes” which is simply just 5 ingredients. Make one for yourself. How fun is that! Tuesday, Sept 17: Time for a 10-minute workout. Max reps in 10 minutes. 20 sec of push-ups. 20 sec of squats. 20 sec of sit-ups. Wednesday, Sept 18: Don’t check email until after you’re ready for the day. This is one we struggle with all the time. It’s easy to check the email and social media as soon as the alarm clock goes off on the phone. Am I right? Today’s challenge is simple. Just commit to checking all these things after you have gotten ready for the day and have eaten a healthy breakfast. It is a simple thing that tells our minds that we care about our bodies and ourselves first. From there we can pour our lives into others better. Thursday, Sept 19: Replace one conventional beauty item. Today decrease the amount of chemicals and toxins you put on your body. How about trying the oil cleansing method or switching to an all-natural makeup product? Try to make at least one switch today. You could always try rinsing your hair in apple cider vinegar and water for a silky shine! Friday, Sept 20: Make an effort to sit with good posture. Slouching is so out… at least for today! We personally sit at our computers way too long because of work and blogging. We know that we are not alone in this so today we are committing to sitting up straight, walking straighter, and being mindful of our posture. It really is an exercise to think of yourself and to be aware of your body. Saturday, Sept 21: Find a healthy version of your comfort food. Macaroni and cheese is a classic. Maybe today you could switch to a gluten free, organic brand? What is one of your comfort foods? Search the Internet or recipe books for an alternative that will leave you satisfied and “boost” your nutrition in the process. Remember that we promote healthy eating for a lifetime- so that means improving your comfort foods at times! Sunday, Sept 22: Sit or walk outside for 30 minutes. You can choose to make today’s challenge either restful or active. That part is totally up to you. The point is just to be with yourself and to be mindful of your body again. Take the time to connect your mind to your body. Get out in nature and walk. Sit out in the sunshine. You could even sit in your closet and just simply be alone with your thoughts. We are way too busy these days! Monday, Sept 23: Treat yourself. We have a great post all about this topic right here. Today’s challenge goes well after yesterday’s challenge. Today we want you to continue to be mindful. We want you to take time to slow down. Pamper yourself, sleep longer, eat well, stretch and breathe deeply, laugh a lot, or get out and explore. Do whatever you want, but enjoy your day! Tuesday, Sept 24: Time for a 10-minute workout. Max reps in 10 minutes. 20 sec of push-ups. 20 sec of squats. 20 sec of sit-ups. Wednesday, Sept 25: Set a timer and draw/journal for 10 minutes. Today’s challenge requires only 10 minutes. We all have that! You only need paper and a pen/pencil. Sit down and write your thoughts. Just let them flow. Draw or sketch if that is more down your alley. We just really want you to be present in the moment today. Thursday, Sept 26: Schedule a date/friend night. We think this is something we should all be super intentional about on a weekly or monthly basis, so today we want to encourage you to start this practice. Health is great, but it means nothing without relationships in our lives. So make time today to spend with those you love. Drop the to-do list and “responsibilities” and love those in your life. Do it well. Let’s make it a goal to be healthy to love “our” people better and to spend more time with them. Friday, Sept 27: Buy a new workout outfit! It really helps. We like to feel somewhat cute and confident in our clothes. This is especially true when we workout. It is a really good confidence booster and just makes the experience more enjoyable. So today go out and get you a new workout top or some new yoga pants. If you don’t have the money to spend (that’s ok!) just put together a cute outfit that makes you want to workout in it! Sometime we need all the help we can get. Saturday, Sept 28: Mix up your workout routine. Today mix up your workout routine with something more fun! Go to the park and hike, play a game of football (since it’s football season), or ride bikes. Do something you normally do not! When it’s fun it does not feel like exercise! Sunday, Sept 29: Fast from Technology. Today is a screen free day! Completely. No Facebook, Twitter, Instagram, Emails, and Blogging. We are preaching to the choir over here. Let’s try to do this today and let’s be honest with ourselves, because we will probably feel the withdrawal pretty quickly. Maybe this will teach us something?! So many good ideas here! Love the time management worksheet and not checking my phone before I get ready in the morning. Thanks for putting all of this together! Glad you like it! Let us know things are going!